Highway 11 past North Bay in the dead of winter is not a road for the faint of heart. The divided four-lane highway turns into a two-lane road all the way up to Timmins - my final destination - and well beyond. Snow squalls, heavy winds and occasional black ice make this route treacherous and nerve-wracking, especially at night - which adds the danger of lumbering moose attracted to salt on the roads. 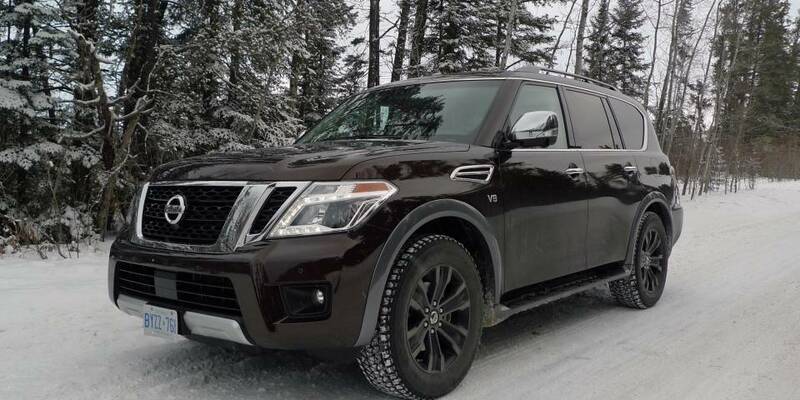 So, I'm happy to be making my run to the hometown in something all-wheel drive with Bridgestone winter tires and, quite frankly, a huge footprint: the 2017 Nissan Armada. It's a tank, solid as anything on the road, and my driving partner - a whiny cat protesting his carrier incarceration - and I both feel a bit safer in this quiet tomb. Of course, the curb weight of 2,694 kilograms and its 5.6-litre V8 mean the fuel economy isn't so good - I couldn't get below 12 L/100 km on the highway from Toronto to Timmins, and around town that rises up to hover around 20. But if it means peace of mind, so be it. That V8 is silky smooth, though, and there's more than enough power for the occasional passing lane that pops up to get past the slower trucks that forever cover this route. It also offers a pleasant, cosseting ride with light steering and decent agility, considering its heft. And inside is a comfy place to be; big, cushy seats, wide-open spaces and a commanding view ahead; if I had three passengers besides the noisy cat, they'd feel the same way. Captains chairs in the second row would allow for outstretched legs, drinks held securely in the centre console and the rear heat adjusted just as they like. Supple leather covers the chairs, with a comfy heated option, and music playing from the satellite radio could fill the silence the Armada offers. The cabin offers a luxurious and pleasant place to while away the time on long drives.